A Kid-to-Kid Guide to Keeping Private Parts Private. Helping kids set healthy boundaries for their private parts can be a daunting and awkward task for parents, counselors and educators. Written from a kid’s point of view, I Said No! makes this task a lot easier. The book uses kid-friendly language and illustrations to help parents and concerned adults give kids guidance they can understand, practice and use. This is a simple, direct approach that doesn’t dumb down the issues involved, as well as an easy-to-use system to help kids rehearse and remember appropriate responses to help keep them safe. What Happens Next? 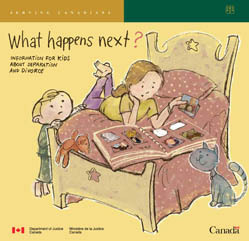 Information for Kids about Separation and Divorce is a booklet published by the Department of Justice Canada to help children between 9 and 12 years old cope with the separation or divorce of their parents. It is meant to help children learn some basic facts about family law and give them an idea of the processes that parents may go through when they split up. It is also meant to help children realize that it’s normal for them to have an emotional response to their parents’ divorce, and encourages children to voice their concerns to someone they trust. To order copies, please contact the Family, Children and Youth Section of the Department at 1-888-373-2222 or 613-946-2222, or by e-mail at cca-dgve@justice.gc.ca. It is also available on-line in the Supporting Families section of the Justice Web site. Without being taught about body boundaries, a child may be too young to understand when abuse is happening — or that it’s wrong. This straightforward, gentle book offers a tool parents, teachers, and counselors can use to help children feel, be, and stay safe. The rhyming story and simple, friendly illustrations provide a way to sensitively share and discuss the topic, guiding young children to understand that their private parts belong to them alone. The overriding message of My Body Belongs to Me is that if someone touches your private parts, tell your mom, your dad, your teacher, or another safe adult. If you or your children have been abused or feel unsafe around the other parent, you need to put safety first. If you are concerned about your safety or your children’s safety, see “When There Is Violence in the Home” in Section 8 for information on family violence and where to find immediate and longer-term assistance. You should also keep in mind that some of the information contained in this resource may not be appropriate to your situation. Help is available; reach out now. To order copies, please click this link ORDER HERE. It is also available on-line in the Supporting Families section of the Justice Web site. That Uh-oh Feeling: a Story about Touch. No matter how hard she tries, Claire can’t kick the soccer ball in a straight line. Her coach steps in and places his hand on her shoulder, telling her that she’s too pretty to wear a frown. When he tickles her later and asks her to keep it a secret, Claire doesn’t know exactly what’s wrong, but something just feels “weird.” Too much flattery and too much contact give her that weird, uh-oh feeling. She turns to her friends for help and learns that adults shouldn’t ask kids to keep secrets about touch, so Claire tells her mother. By seeking help from others and talking about her feelings, the situation is resolved happily.